When we updated our website last year, we added a really awesome new pattern page with lots of improved search features. So many, in fact, that we realize it might be a bit overwhelming for some of you! 1) You can access our search page by clicking the word “Patterns” or the phrase “Pattern Search” from the menu at the top of any page on our website. 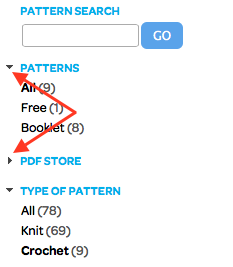 2) The default pattern page will show you all of our patterns in order from newest to oldest. You can click on any of the filters at the top right to change this order. 4) If a filter is faded, it means there aren’t any patterns in that category that meet your other requirements. If a filter is bolded, it means you’ve already selected it. 5) You can remove all of your search parameters by clicking “Reset All Filters” or just one or two by selecting the “x” next to the designated filter at the top of your page. 6) You can also open or close certain categories of filters by clicking the little triangle next to the title. And that’s really all you need to know…Happy Searching! Congratulations, Lorinda, you won our Crocheting Clothes Kids Love Giveaway! Please contact apalumbo@berroco.com within the next week to collect your prize.